Two and a half weeks down, and we’ve had an exciting week over here! Leighton gained almost 1 pound in a week, and it seems like she’s growing and changing every day. She’s gotten to meet my grandmother Nannie and my aunt, as well as a few other friends this week. And one of the highlights was having my childhood best friend and her mom come up to visit for a few days to take her newborn photos! What a special thing to have someone so important to me be able to document our baby girl in her first few weeks here with us. 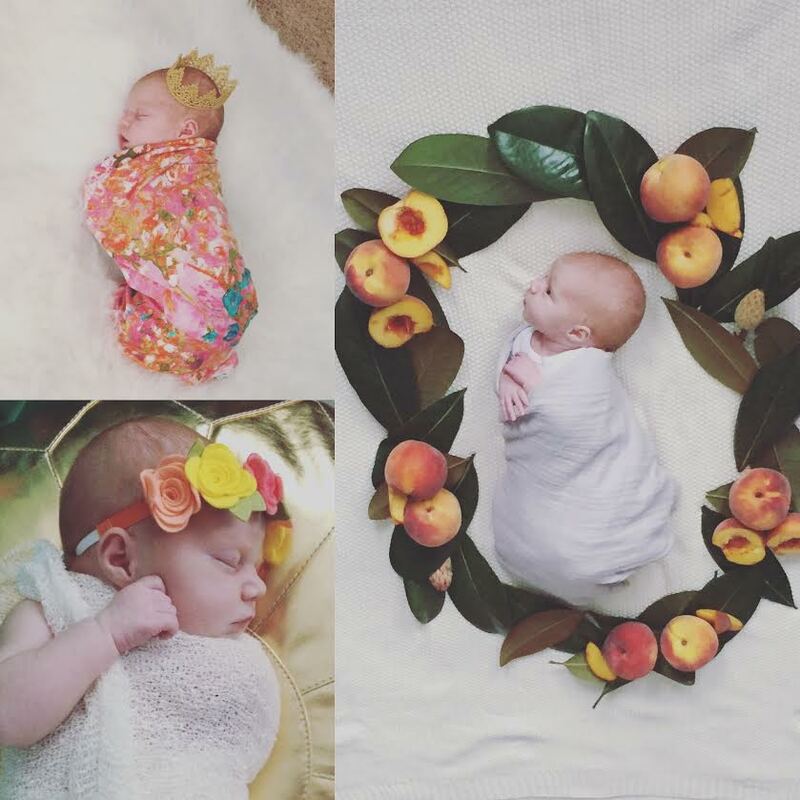 We dressed her up in crowns and headbands and stuffed her in football helmets and surrounded her by GA peaches… so much fun! I am really excited to see the finished product, and I know these photos will be treasured forever. In other news, we’ve started the Moms on Call sleep/feeding schedule, so hopefully we’ll have a hang of that before too long. She’s giving us a run for our money some days, but her sweet and cuddly little self if worth it a thousand times over. In one week, I have learned more than I have at any other point in my life. In the matter of a moment, I became a mom and Craig became a dad. Our lives changed in that instant, and we have been on a crazy ride since then — a ride that neither of us would change for anything. I know we have a lifetime of learning ahead as parents, and we’re by no means experts at this thing yet, but we have certainly learned a lot already. – Time flies. 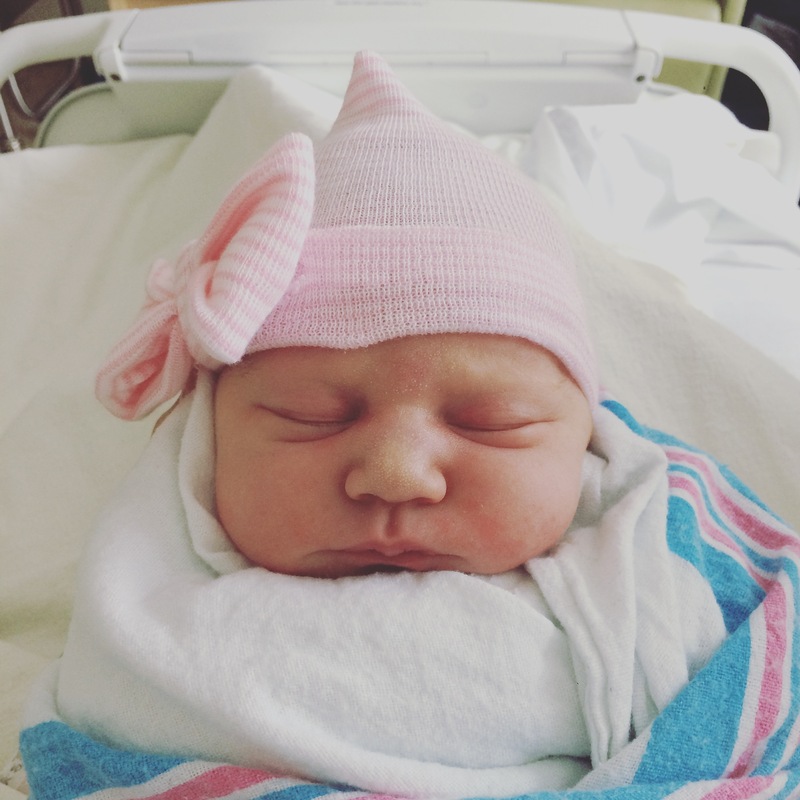 As I started writing this post (one-handed while holding baby girl at 5am, mind you), I realized that exactly one week ago, I was holding my daughter on my chest for the very first time. It was the most surreal moment of my life. 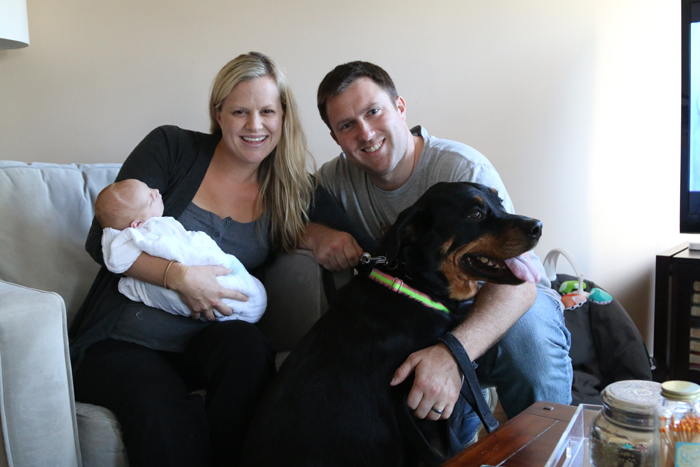 She is now already one week old, and Craig and I have survived our first week as parents. 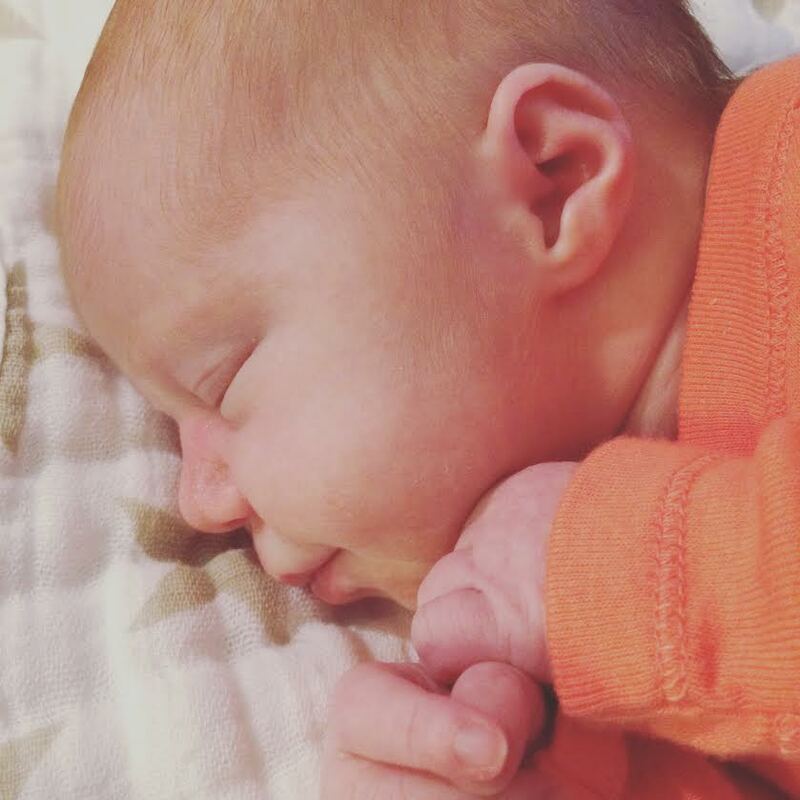 It’s hard to believe that we’re already home with this angel and starting to settle into some semblance of a routine (even if it currently revolves solely around feeding, diaper changing, and sleeping). I’m doing my best to savor these moments, even the trying ones, because although the hours may seem long, the days are short. She’ll never be as tiny tomorrow as she is today, and that’s something I hope to remember and embrace each day. – Patience is a virtue, and it also takes practice. 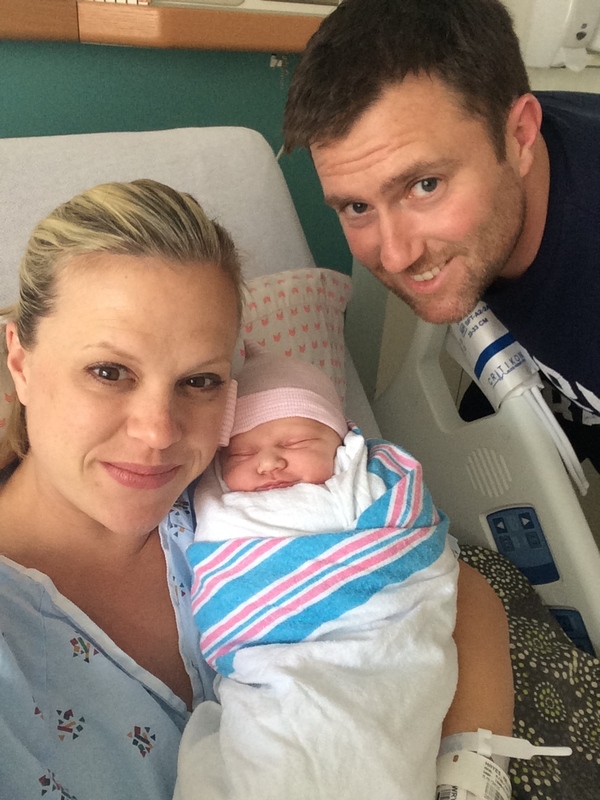 In the hospital, someone told us that a baby will make you learn patience, and they couldn’t have been more spot on. I am beginning to fully understand why God made babies so cute, sweet, and cuddly — to make up for seriously trying our patience and sanity! Craig can attest to the fact that I’m not the most patient person. He, on the other hand, has the patience of a saint, which is something I admire, try to learn from, and am now more thankful for than ever. He’s especially good with L’s cry sessions that seem to be about nothing – and usually take place at a time of day when no human should be awake, let alone wandering around the house “shhhh-ing” and bouncing a tiny baby in hopes of rocking her back to sleep. – We will be doing a lot more laundry than I expected. Babies are messy, and they have excellent timing for spitting up on clothes you’ve only just changed. Good thing we bought a new washing machine last week. – The human body can adapt and run off of very little sleep very easily when it’s for a good reason. We have both found that even after a night of just a couple hours’ sleep, we’re somehow still able to function like normal human beings for the majority of the day. Even Coco has seemed to quickly adapt to this little person who has invaded her space. She sniffs everything Leighton touches and even in the middle of the night, if L makes a noise, Coco has been quick to go check in on her. – Babies are tiny, but they are strong! I feel like we needed degrees in alligator wrestling in order to properly and efficiently change her clothes and diapers when she’s wiggling around like a little monkey/snake/jitterbug/rascally animal of choice. – Teamwork truly does make the dream work. 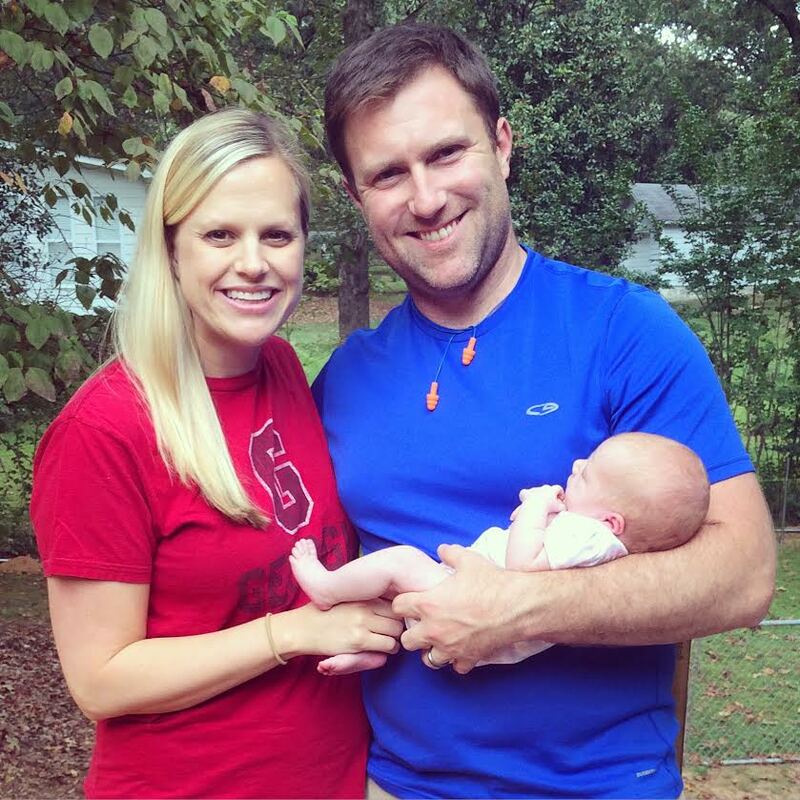 Craig has been 100% on board and involved in every aspect of caring for our little one from the minute she was born. He happily obliged when I asked him to take on the probably daunting task of photographing her first moments because I was unable to. He jumped right in for her first diaper change in the hospital, only to have her not-so-politely request another change before he could even get the first diaper on. He has quickly learned how to dress a squirmy newborn, and he even helped me dress her up in a tiny swimsuit yesterday just for fun. He fixes and serves dinner while I feed Leighton. He rocks her when she’s fussy so that I can have a moment to check work emails (and maybe play on the computer a little). He switches off with me in the middle of the night so that I can get more than 30 minutes of solid sleep. He is the best daddy and I couldn’t have asked for a better teammate to do this with. – We have really amazing family and friends. Calls, texts, emails, and social media messages with well wishes, advice and prayers, visits to meet L, food deliveries to keep us going each day. We are so grateful for each and every one. It really does take a village, and our village is pretty awesome. 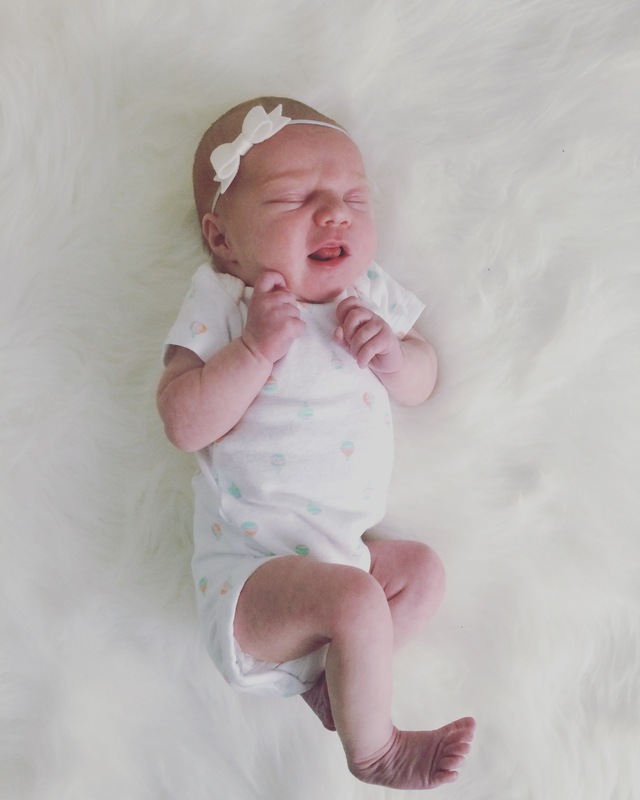 Well, it’s easy to say that my favorite thing this week (and of all time) was bringing Leighton into this world on September 10th! 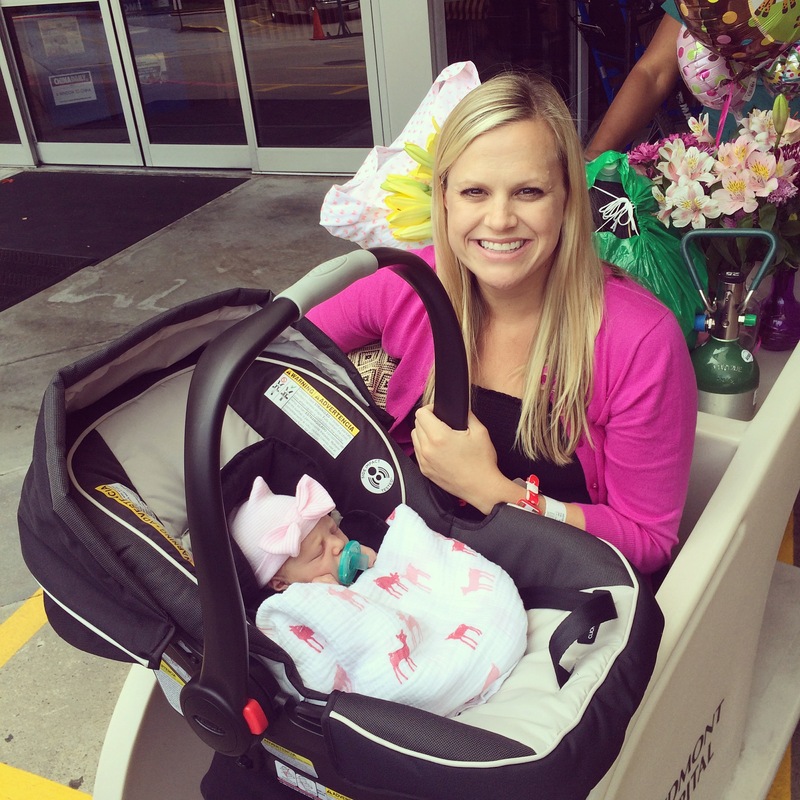 We got home from the hospital Saturday afternoon and spent the next couple days soaking up time with our families. We’ve been on our own since Monday, and while it’s been a bit trying at night, we’re slowly getting into the groove as a family of 4 (of course Coco counts!). 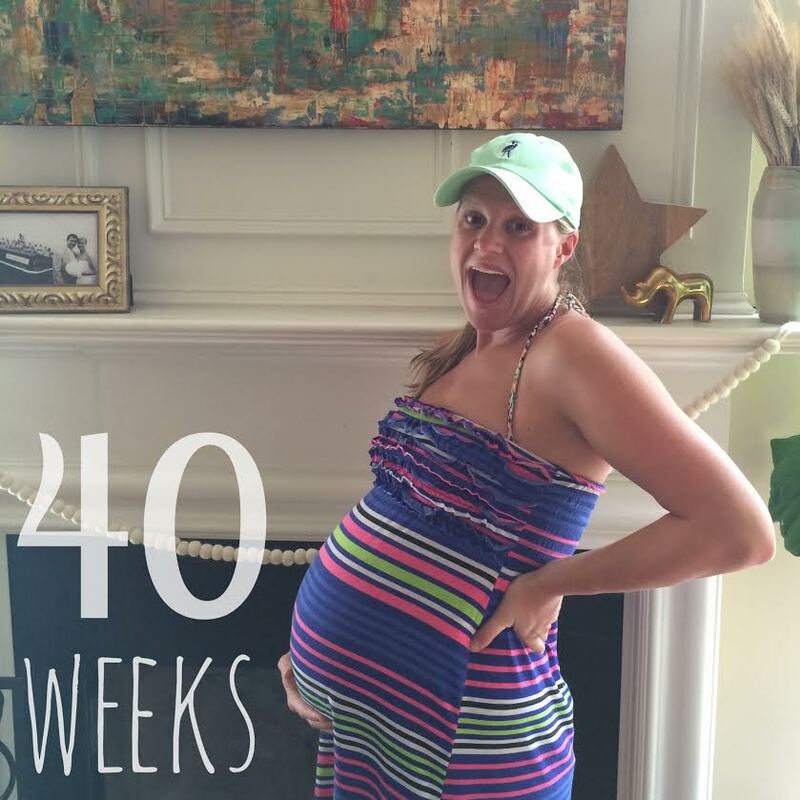 # weeks: 40 — baby is the size of a jackfruit! Measuring approx 19-22″ long and weighing about 7-8 lbs. Best moment this week: The start of football season! 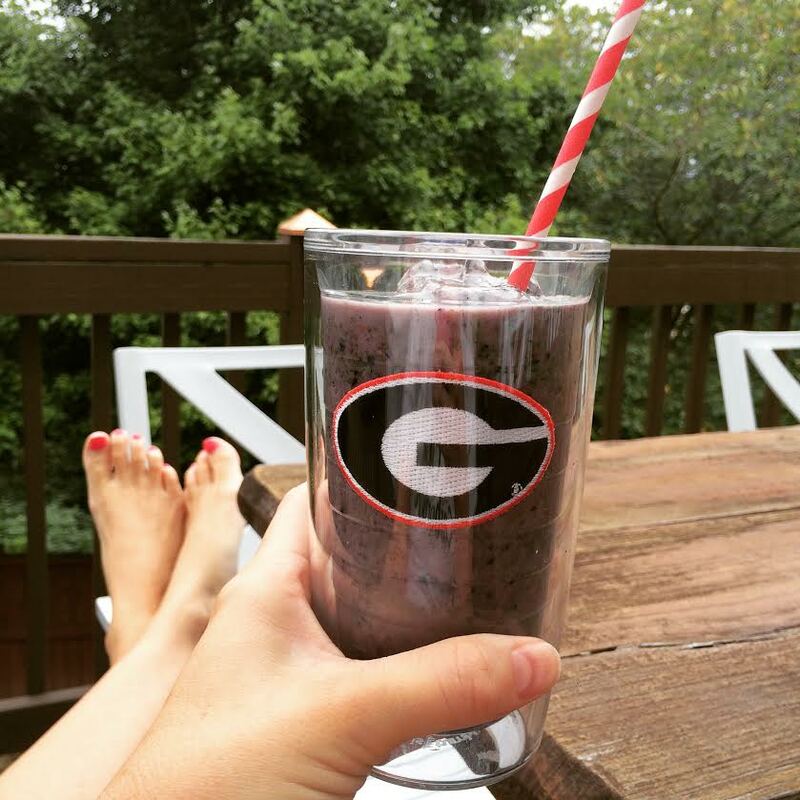 Georgia and Auburn both won their games, so we had a happy household on Saturday. And while we couldn’t make it to Athens for my game, we had fun watching it downtown with friends before heading home to catch the Auburn game on the projection screen. We also had an impromptu date night at Bocado over the long weekend — they have one of the best burgers in town. It may very well have been our last solo night out before becoming parents, which is sort of hard to believe! Miss anything: Normal sleep, ShockTop during last weekend’s football games, being able to bend over easily… ya know, the usual at this point. Cravings: A grilled hot dog, which I got on Labor Day! Yay! 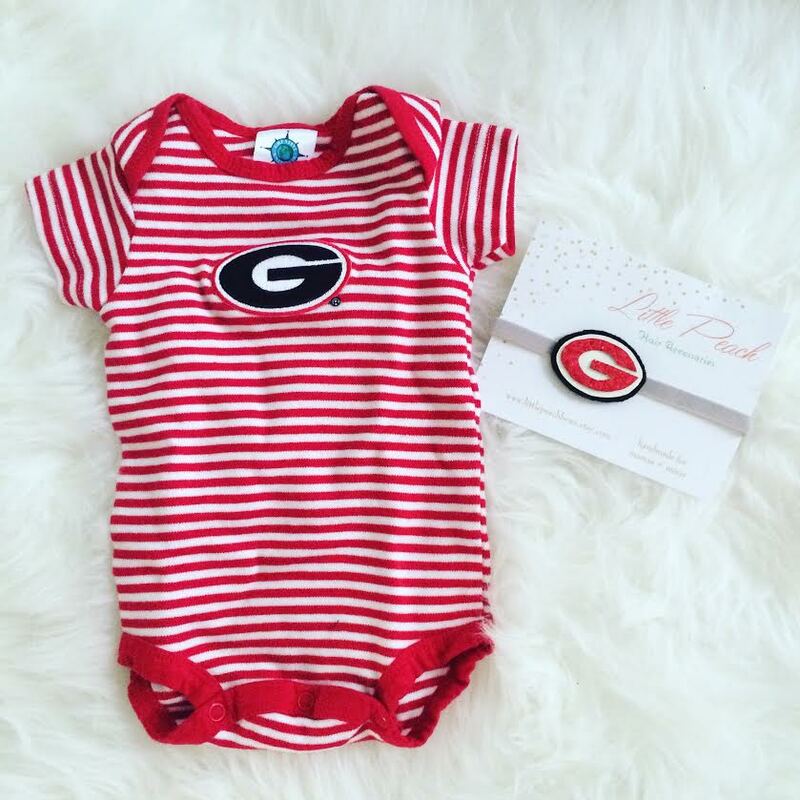 Baby purchases/gifts: I might have gotten this glittery UGA headband for her first game day… can’t wait to deck her out in both her Georgia and Auburn gear this fall! Looking forward to: Meeting our girl!! We’re officially at our due date, but I also realize that it’s just an estimate… so as long as she’s healthy, it’s not the end of the world if she doesn’t come today. I have a doctor’s appointment on Friday, and if she’s not here by then, we’ll start talking plans for how to proceed. We are all hoping and praying she’ll make her debut very, very soon, though! We’re ready to see her sweet face! Well folks, we’re still here and waiting on little lady to make her debut! Last week was what I jokingly dubbed my “week of leisure” since I’m now done with work. I fully enjoyed several lunch dates, trips to the pool, sleeping in, and just relaxing in preparation for what’s to come. All the “to-do” items are checked off my list, and I’m such a busy body that now I’m getting a bit anxious with nothing left to do but wait. My due date is on Wednesday the 9th, so we’re all hoping and praying she’ll decide she wants to join us very soon! 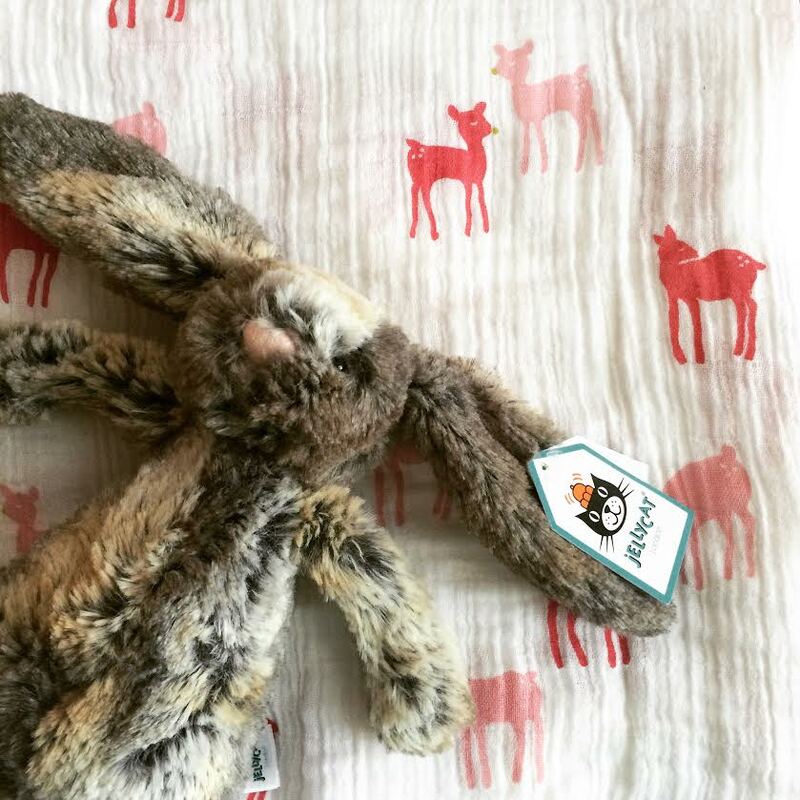 When I found out I was pregnant back in January, I was excited to start looking for maternity clothes, even though I wouldn’t really need them for several months. 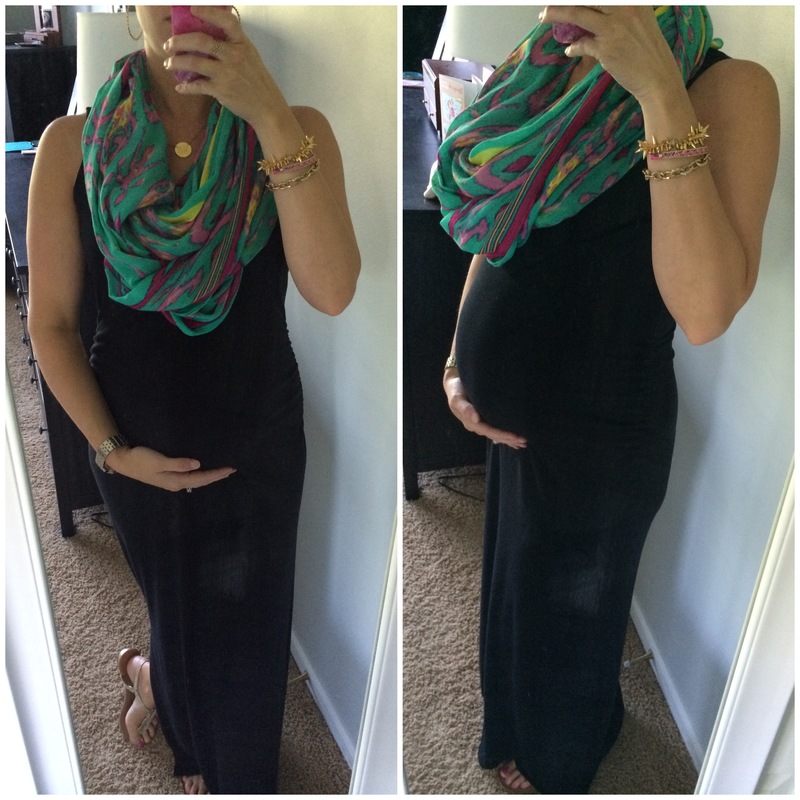 I quickly realized that the majority of maternity clothing options out there just aren’t that cute, flattering, or affordable (considering the short amount of time they’ll be worn). So I set out to make the most of my current wardrobe and filled in the gaps with some easy, cheap maternity finds that would last me the entire 10 months (and yes — it really is 10 months!). 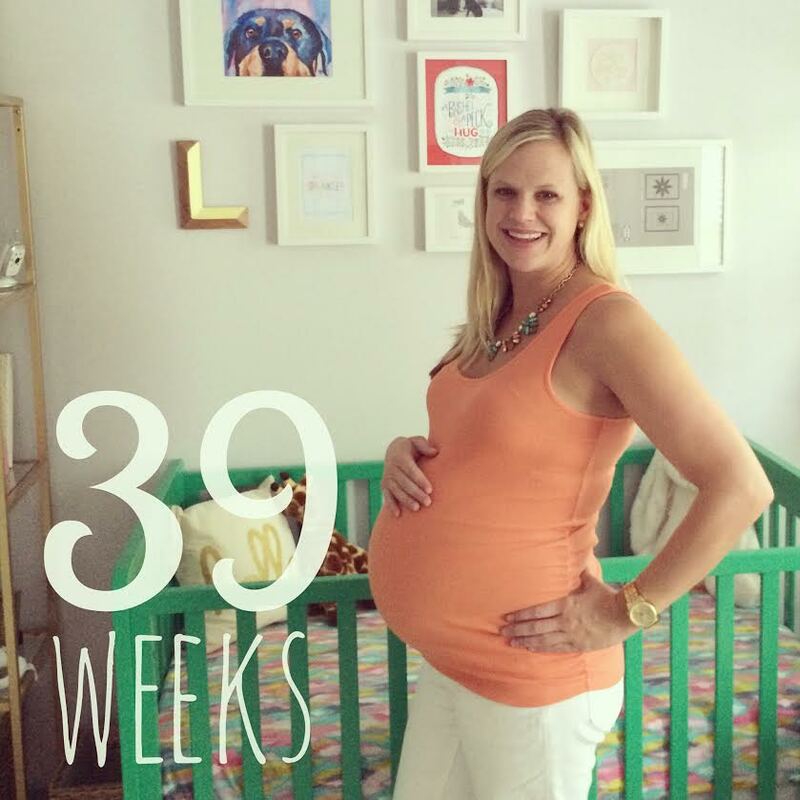 For any other mamas-to-be out there, hopefully you’ll find these tips helpful! 1. Take stock of your current closet. For the first few months, I took advantage of my regular button-downs, looser sweaters, vests, and jackets due to it being winter and early spring. I also made good use of the “rubber band” trick that so many had told me about (using a hair tie or rubber band to fasten my regular jeans and give them a little more wear time before making the leap to maternity jeans). Once warmer weather began to roll in, I took stock of what maxi dresses and skirts I already had, as well as both flowy and fitted tank tops that would work with the maternity jeans I’d bought. It turned out that many of my regular tops would fit over my growing bump for several more months, helping to stretch my closet a bit further. 2. Shop for wardrobe staples. 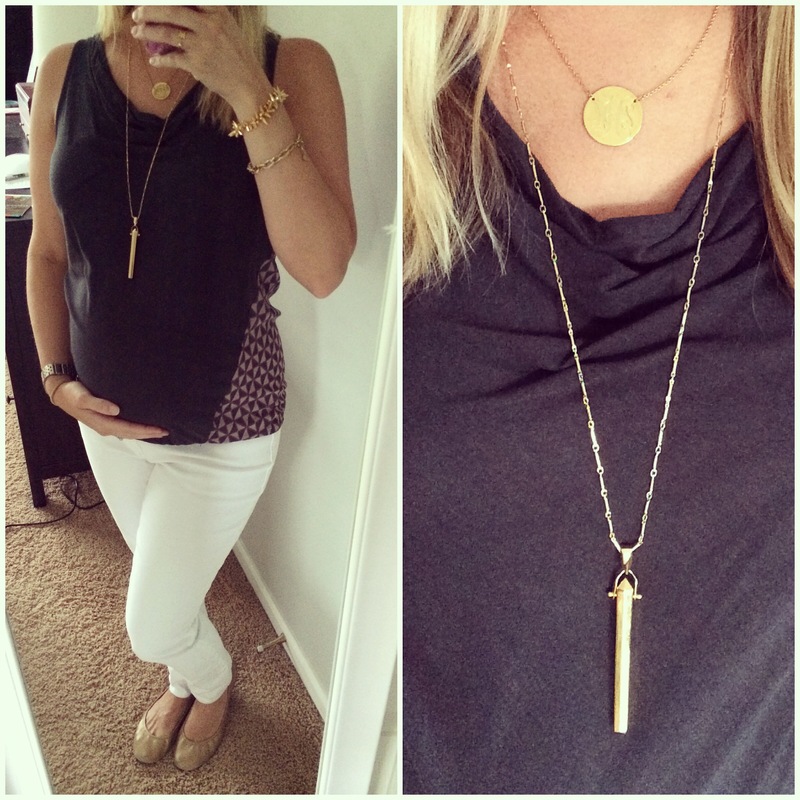 Once I knew what I could use from my current closet, I needed to fill in the gaps with some maternity wear. 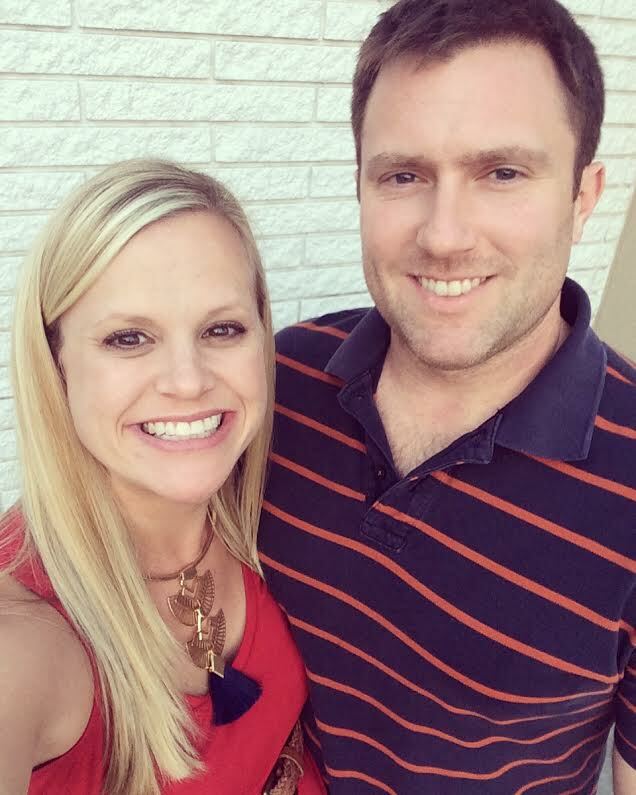 I chose to stick to affordable options like Old Navy and Target for 90% of my clothing purchases, knowing that while I’d wear them a lot during my pregnancy, that amount of time was quite small in the grand scheme of things. Additionally, Old Navy ALWAYS has sales, so I almost never paid full price for anything. 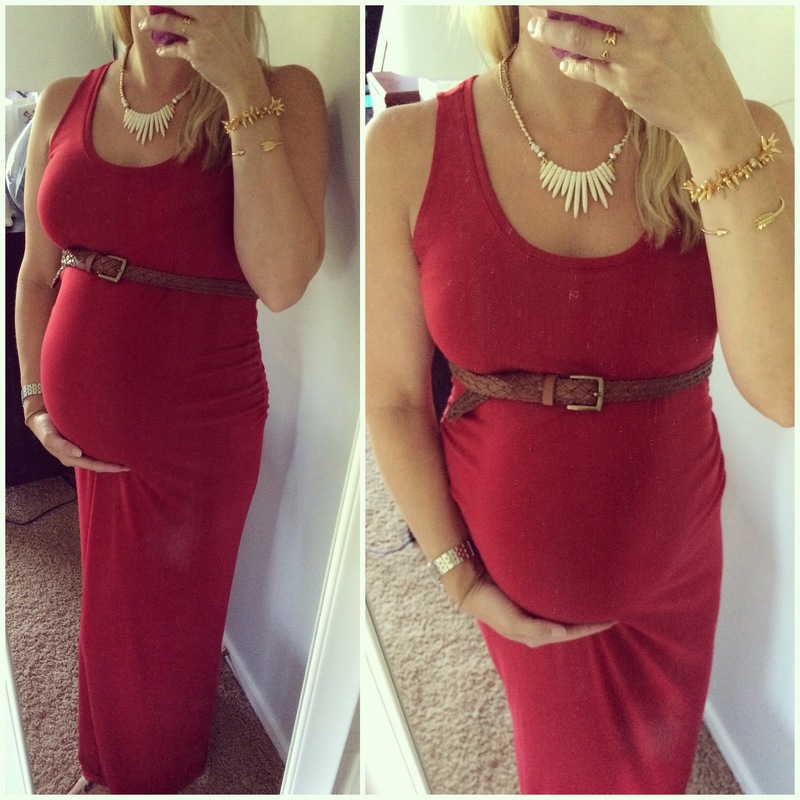 I fell in love with their maxi tank dresses and bought them in 3 different colors. They’re incredibly comfy, they have accommodated both a smaller and larger bump, and I still feel cute in them at over 39 weeks along. Another staple were the Old Navy rib knit jersey tank tops, which I bought in several colors and have worn with jeans, shorts, and maxi skirts. I also got a pair of cuffed jean shorts from Target, which I have worn every weekend this summer. A few of my girlfriends had babies earlier this year and were thus done with their maternity clothes for the time being, so they kindly offered to lend me some of theirs. If your friends offer, take them up on it! I added several dresses and a few tops to my wardrobe this way without having to spend a dime, and I plan to offer up my maternity clothes to other friends down the road in return. 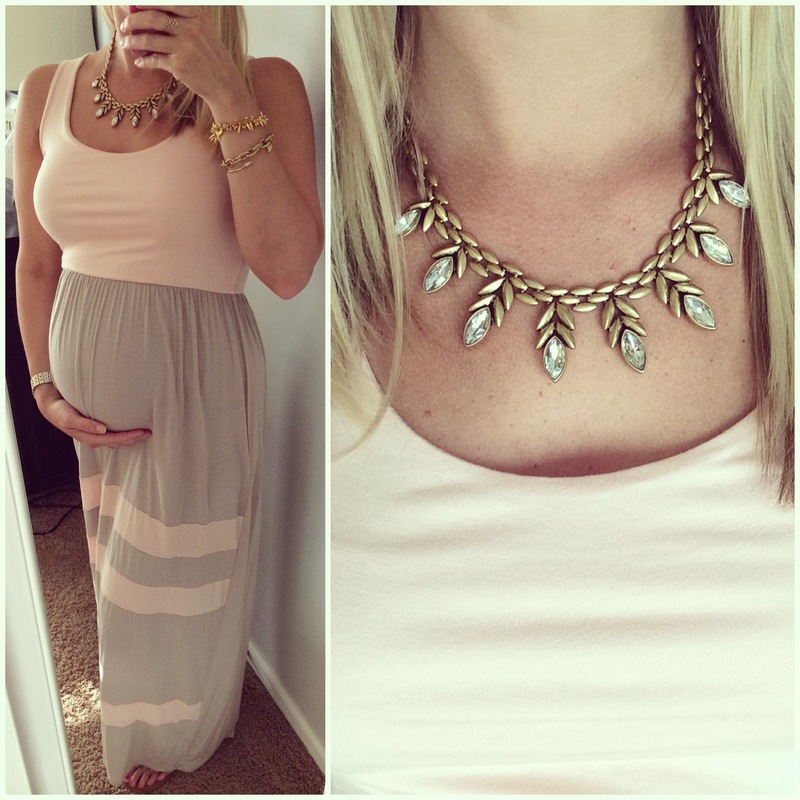 I particularly loved this Pink Blush Maternity maxi (no longer on the website) that my friend Shannon lent me — the colors are so pretty, it’s super soft and comfy, and it was perfect for some of our maternity portraits, too. 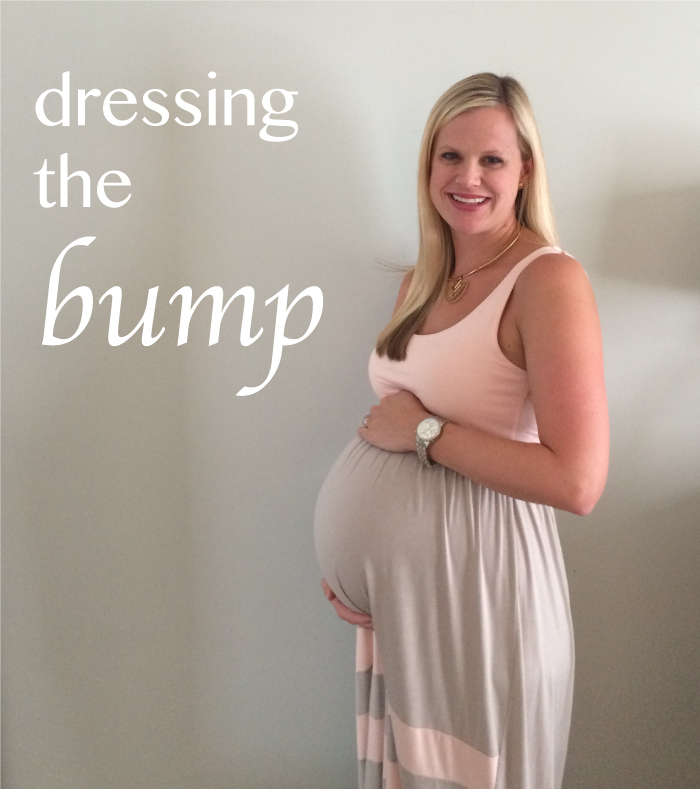 Accentuate that bump with a belt! I have just about worn the gold glitter off my Target belt this year because I’ve worn it so often. 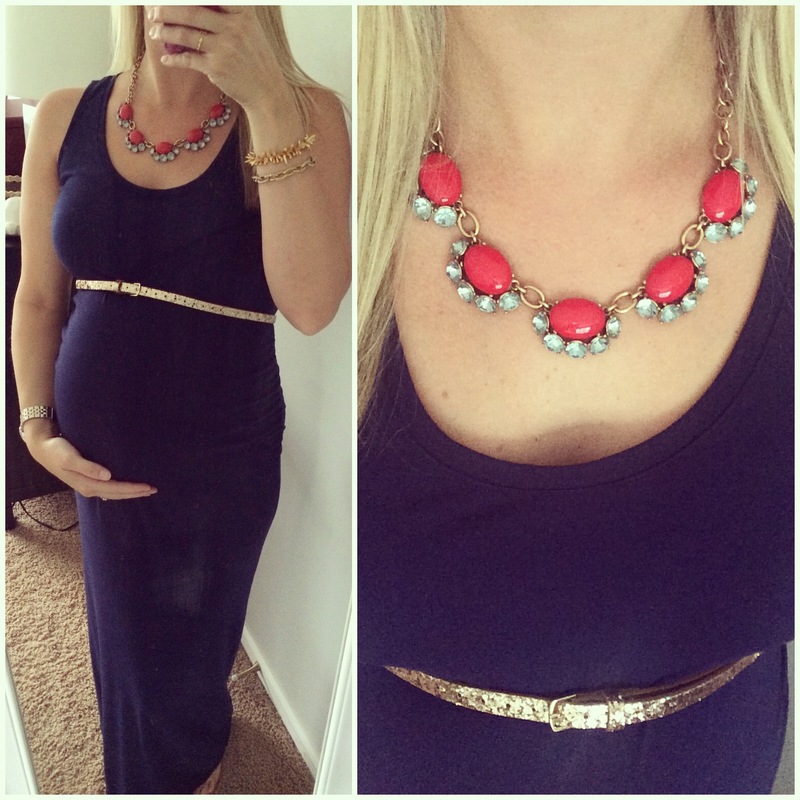 I love belting loose tops and dresses as well as the more form-fitting dresses to emphasize where the baby bump begins – and add some interest to the outfit. 5. 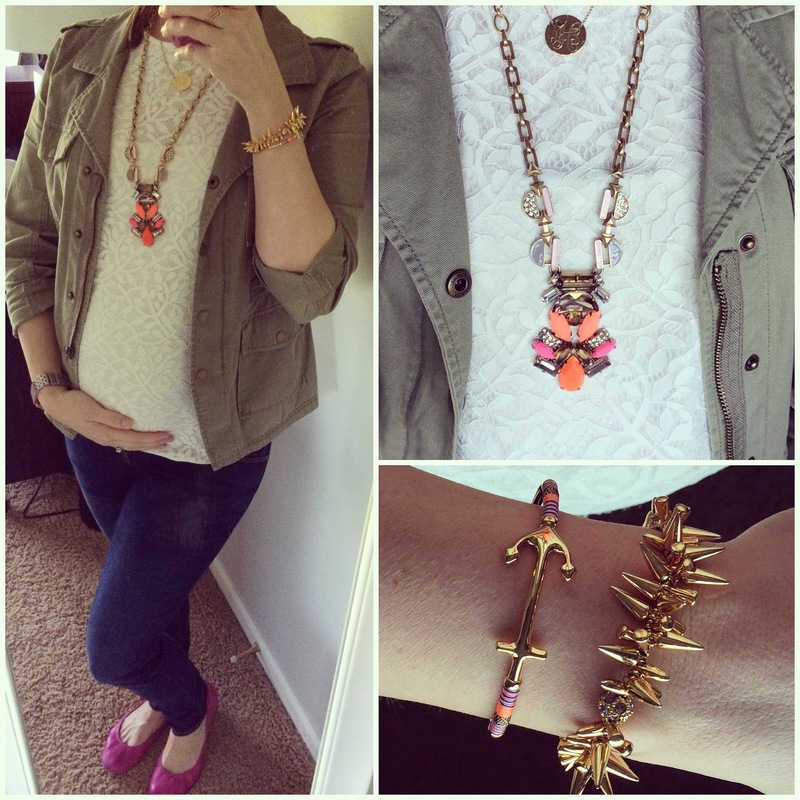 Change up the same outfits with jewelry and scarves. As the months have gone by and my belly has gotten exponentially bigger, my wardrobe has gotten exponentially smaller… funny how that works, huh? 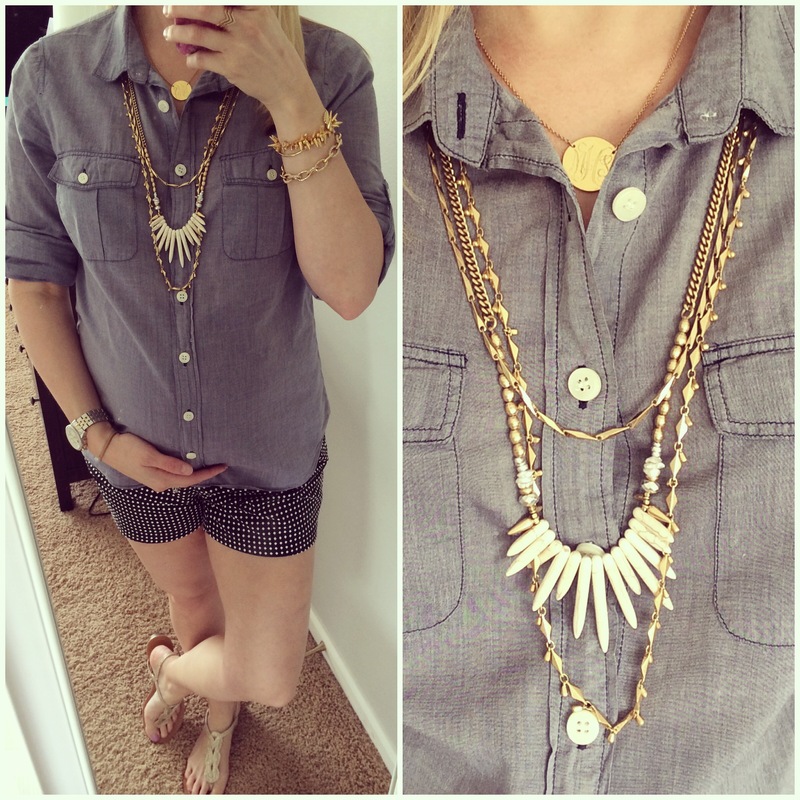 So instead of constantly buying more maternity clothes, I made do with the staples I purchased and just changed up the look with different jewelry and scarf options. 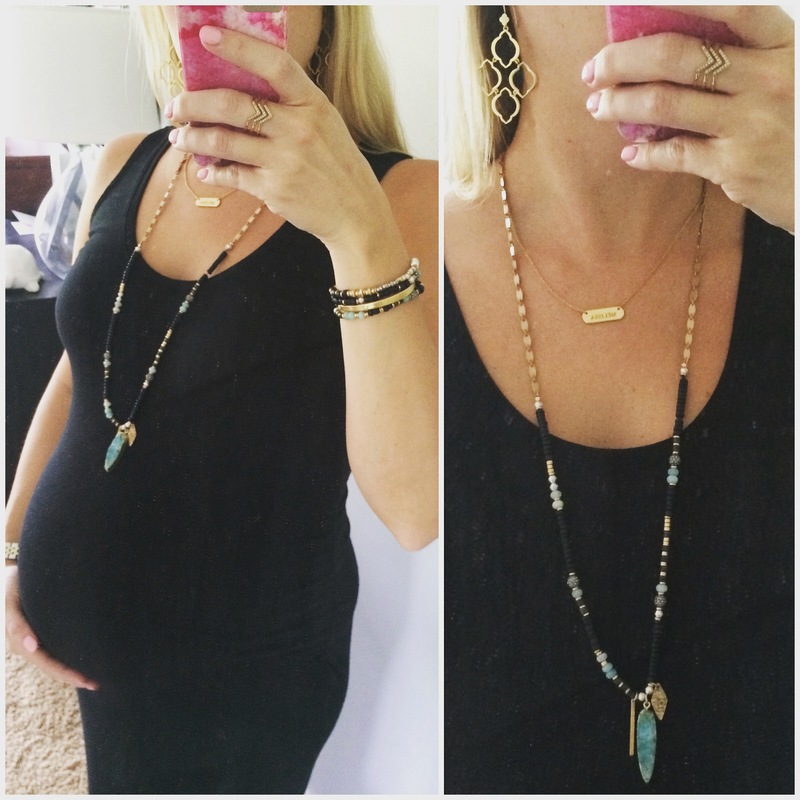 Being a Stella & Dot Stylist certainly has its perks when it comes to this, and it’s made my bump styling so much more fun. Here are some of my favorite ways to style the same outfit with different accessories, including a short necklace and gold belt combo, a doubled-up scarf, and a pendant necklace with chandelier earrings. For the office or cooler weather, you could easily add a cardigan or a button-up (not buttoned, of course) over the dress for even more versatility.